Also moving forward are preparations for the ‘Celebrating 30 Years of the Canterbury UNESCO World Heritage Site’ because as well as the St Augustine’s Feast Day service and procession, and the conference and light show at St Augustine’s Abbey, there will be an A – Z Advent-calendar style celebration of the three aspects of the Site. This project has been led by Professor Peter Vujakovic and these illustrated short pieces will offer some interesting material as a prelude to the celebrations. 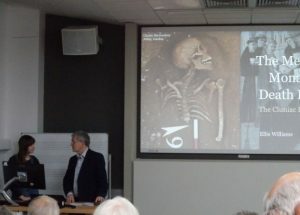 As will Professor Paul Bennett’s lecture on Wednesday 8 May at 6pm in Old Sessions, where he will be speaking on ‘The Canterbury World Heritage Site – an archaeological perspective’. All welcome. Now to this week and, in many ways, I shall be focusing on the Middle Ages. Firstly, Professor Louise Wilkinson chaired a very upbeat meeting about preparations for the activities planned for Becket 2020 that will involve numerous organisations, groups, churches and individuals in Canterbury, Kent and even further afield. I don’t want to give much away at this point but there will be a super Medieval Pageant with more giants, several conferences, workshops and talks featuring St Thomas and other saints, events around the theme of pilgrimage and much more. 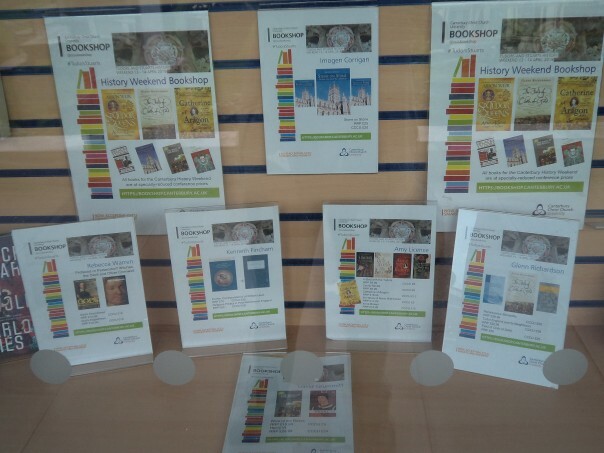 In addition, because 2020 marks important anniversaries at other cathedrals, these cities too are planning a calendar of events, indeed Hereford is starting its programme in October 2019. 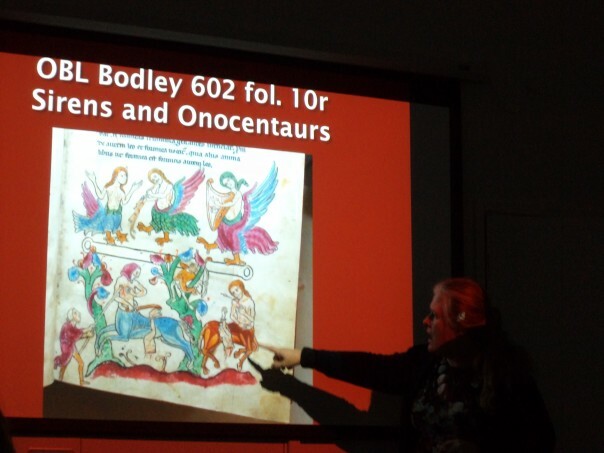 Keeping with the idea of the community of the living and the dead in medieval times, Dr Ellie Williams (Archaeology, CCCU) gave a fascinating lecture last Thursday. 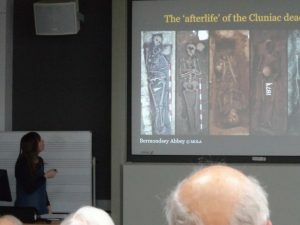 This joint Centre and Friends of Canterbury Archaeological Society [FCAT] presentation attracted a large audience, including several CCCU students who came to find out about the Cluniac rituals associated with death and burial within these monasteries. 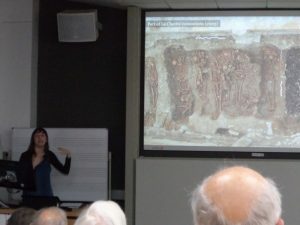 Drawing on her doctorate, completed at the University of Southampton, she discussed her analysis of the burials found during archaeological excavations at the monasteries of Bermondsey Abbey (202 discrete burials) and La Charité-sur-Loire (48 such burials), major Cluniac establishments in England and France respectively, as well as the writings of St Benedict and his successors, and those of Bernard of Cluny, a 12th-century monk. These works include the Regularis Concordia (dated 970) and other custumaries (regulations), as well as Bernard’s long poem in which he discusses the certainty of death. 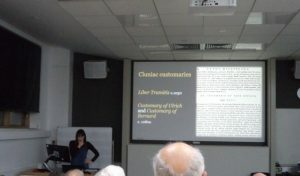 For her research, Ellie made special use of the translation of the Clunaic customaries made by Frederick Paxton which she found fascinating and ideal for her study. If anyone would like to follow this up, this recent volume will be of particular value: Paxton, Frederick S., with Isabelle Cochelin. The Death Ritual at Cluny in the Central Middle Ages / Le rituel de la mort à Cluny au Moyen Âge central. Disciplina Monastica, 9. Turnhout: Brepols, 2013. Pp. 283. ISBN: 9782503550107 (hardback). Employing all of these texts, Ellie noted that there is a considerable emphasis on the process of dying well, the immediate aftermath, funeral provisions and the place of the deceased in the continuing life of the community – a bringing together of the living and the dead articulated in both the texts and the burials. 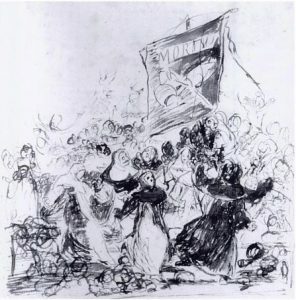 Indeed, she believes such elaborate liturgical ceremonies and rituals were a vital aspect of Cluniac identity as the mother house at Cluny sought to keep its numerous daughter houses within this special monastic fold, albeit such instructive texts do not always appear to have been followed religiously, as seen in the burial evidence. To illustrate this analysis, Ellie took her audience through the various stages from the infirmary to the cemetery, starting with the dying monk who when close to death was to be surrounded by all his brother monks in the infirmary as a way to protect him from the Devil. Then at death wooden boards were to be clapped in the cloister, bells were to be rung and the monks were to come to him, chanting as they came except for those in the choir who could only attend once released by the abbot. This communal response continued through the preparation of the body for burial, which was precisely detailed including specific clothing and footwear, and the vigil that followed, where the prepared body was not left alone in the chapel, this protective ‘blanket’ seen as vital to ensure the wellbeing of the living and the dead. Such ideas similarly informed the funeral and burial in the monks’ cemetery, the chanting monks transposing choir space from church to cemetery, while those who were ill were equally expected to attend, although covered in their cowls for their imperfection might endanger these communal rites. Even though the Cluniac customaries say little about post-internment regarding the deceased, for the living processions (passing over the bodies of their deceased brothers especially due to the particular spatial arrangements at La Charité) and the celebration of obits (the anniversary of a monk’s death) continued to mark the daily liturgical round and it has been calculated that on average these monks would have spent 9 hours per day in the choir. Nor was this exclusive to Cluniac establishments because at Durham Priory (Benedictine) after dinner the monks went to the priory cemetery where their predecessors were buried and stood bare headed for a considerable time to pray for the souls of their departed brethren before returning to the cloister. Those at St Albans followed a similar custom and it is conceivable those at Canterbury too, thereby linking meals and commemoration both temporally and spatially. For those interested in this topic please see: ‘Remembering the dead at dinner-time’, in C. Richardson and T. Hambling, eds, Everyday Objects: Medieval and Early Modern Material Culture and its Meanings (Aldershot, 2010). Nevertheless, even if the texts offer little about the ‘management’ of the dead, Ellie’s work on the burials has revealed some fascinating findings. Among these are that stone tombs were rarely used, although some coffin burials have been found; funerary vessels do occur, as do coins placed on the body, and in some cases the body was covered, or part covered, in charcoal. The arrangement of the bodies is also interesting and not uniform between different monastic sites, those at La Charité far more regimented compared to those at Bermondsey. Consequently, Ellie thinks that at the former the regulations covering the preparation of the body for burial were adhered to strictly, but that does not seem to have been the case at the English monastery. In addition, in some of these grave cuts, as well as the body of an individual monk there had been placed at some point after burial the skull and sometimes other bones of another individual, although the exact meaning behind this practice is far from clear. Having discussed this fascinating topic, Ellie was warmly applauded, and she then took a wide range of questions from her eager audience. In fact, Dr John Williams, who was chairing her lecture, had to call matters to a halt after about 30 minutes, but this did not stop the questions because several members of the audience stayed on to raise more queries and comments – a mark of a great talk! Finally, and keeping with the topic of death, rebirth and community, I thought I would mention a document I found recently in the local archives. Co-D/S/A/Pr.49, fo. 01 is a fragment covering a fascinating late medieval case that involved an altercation that seems to have taken place on the feast day of St Andrew (30 November), although the year has been lost. This feast day, as well as being linked to Advent, was also the point in the fishing year at which the Cinque Portsmen returned from the North Sea (see the entry for Dover in Domesday) and was marked by a colourful spectacle. In this particular year at the De sepultura regis allec’ rube’ festival, the ‘mourners’ who were weeping as they bore the giant king herring on its funeral bier down to the harbour where it was to be ritually buried as custom dictated – marking the end of the deep-sea herring season, safe return and the beginning of fishing in local coastal waters – were set upon by a group of Morris Men. These assailants used their clubs to drive off those escorting the giant herring, and, once they had captured it, they began their own elaborate burial preparations for it on the other side of the beach that involved jangling bells and clattering clubs, much to the consternation of the ‘official mourners’ who were the plaintiffs. Unfortunately, no further details of the case survive but such a festival, without the interruption of the Morris Men, might be worth considering, not least because there are modern Spanish parallels: Entierro de la sardina that apparently revive a much older custom linked to Ash Wednesday and carnival.